The Leadership Grid developed by Robert Blake and Jane Mouton is a very well known leadership theory that is an extension of the Behavioral Leadership Theories. 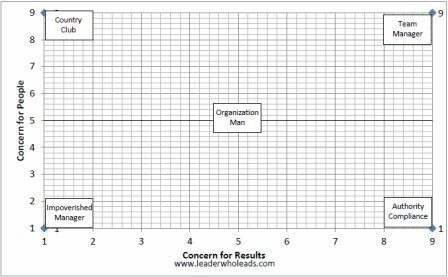 This work, originally referred to as the Managerial Grid, focuses on attitudes that drive behavior: concern for people and concern for results. Blake and Mouton proposes that these two attitudes are independent of each other; therefore, both reside in a leader who operates with a given “style” described below. Two styles were added later: Paternalistic “Father Knows Best” Manager and the “Opportunistic” Manager. The Impoverished Manager has a low concern for results and a low concern for people. The person demonstrating this leadership style is essentially a “non-leader” since s/he has abdicated the responsibilities of their role. In addition, they are not leveraging the “given” authority and influence to develop their people and achieve results. The Country Club Manager demonstrates a low concern for results and a high concern for people. Those working for this leader probably enjoy working for this manager because their needs are prioritized. But the team may achieve marginal results due to the low concern for results, unless the team is composed of high achievers who are internally motivated to deliver results. The Organization Man Manager has moderate concern for people and moderate concern for people. And this team’s results are probably moderate but not stellar; probably rated at or below “meets expectations” on performance. The Authority-Compliance Manager has a high concern for results and low concern for people. This manager is very high task oriented and focuses on being highly efficient. In this manager’s quest for efficiency and high focus on task, effectiveness will be negatively impacted. The Team Manager has high concern for results and high concern for people. A manager who operates at this level is probably highly effective and is a classic demonstration of a leader who leads. The Team Manager leads a team who achieves uncommon results. This leader knows how to motivate a diverse team of people to achieve common and mutually beneficial goals, resulting in a triple “Win-Win-Win” – for team members, the leader and the organization. The Paternalistic Manager demonstrates a “Father Knows Best” attitude. This manager rewards compliance and punishes non-compliance. This manager differs from the Authority-Compliance Manager in that the Paternalistic Manager’s behavior is a result of their concern for the people. The Opportunistic Manager’s does what benefits him/her most and is motivated by achieving what is in their best interest. The manager with this style is probably the most predictably unpredictable depending upon the situation and what is to their gain. As I reflect back on my leadership journey, I have demonstrated all of these styles. Often, operating at extremes due to inexperience and insecurity. But as I have matured, I have moderated and continually seek to be a Team Manager.